ONSIDERING the massive media coverage given to the election of our new Pope, I have to question whether these few thoughts of mine will even be read, but here they are, just in case. It seems to me that sometimes the choice of a Pope is obvious. For instance, in 1939, on the eve of the Second World War, Eugenio Pacelli seemed obvious. 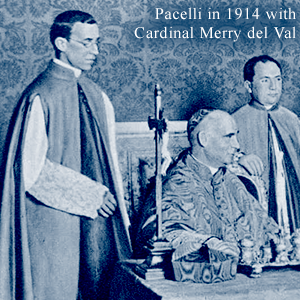 Pacelli was almost a “super man.” Intelligent beyond belief, a violinist and great Theologian, Pacelli possessed a tremendous amount of experience doing all kinds of things and, what’s more, he was . . . saintly and holy. 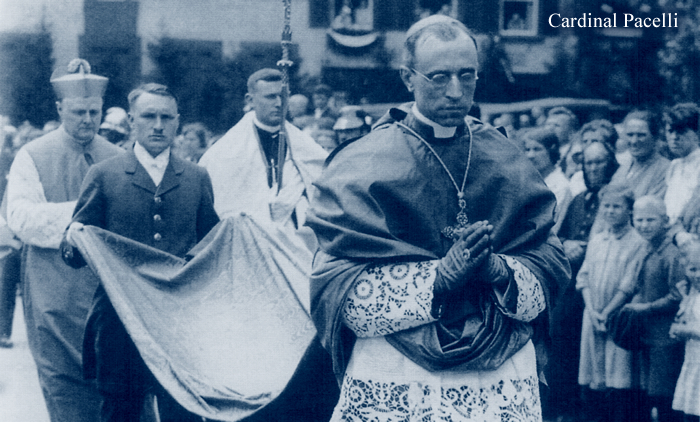 I have no doubt that before WW2, the Cardinals were basically saying, “Who can help us? Who has the authority and knowledge and experience to help us through such times? To whom can we turn? Who can lead us in such times?” The answer was obvious in 1939. Similarly, I think the choice of Pope Benedict XVI was obvious. Cardinal Ratzinger had “done it all”: a brilliant Theologian, he was a former Seminary professor, published author, former head of a huge Diocese, a man with an immaculate record, and someone who had worked at the highest levels of the Church and knew inside out the Curia Romana, since he was head of the Holy Office for many years. Furthermore, Ratzinger was . . . saintly and holy. Those of us who loved “B16” believe that no successor will be able to surpass such a legacy as he left, at least for many years. Only one man could have taken on the severe problems in the Church, and that man was Cardinal Ratzinger, appointed by our Lord Himself for such a task. In 2005, the choice was obvious. It seems to me that in 2013 the Cardinals have elected a Pope who will work to strengthen Spanish-speaking Catholics and bring attention to the poor and destitute. Although I know very little about Pope Francis, everything I’ve read about him is positive, and he seems to possess great holiness and love for our Savior Jesus Christ. Furthermore, he entered the Jesuit order before that order went “downhill.” Such a move required great sacrifice, dedication, and discipline. Back in those days (the “old Jesuits”), Jesuits had to study for 13 years prior to ordination. I’ve heard people say bad things about Jesuits, but they must be talking about the “new Jesuits” (many of whom, sadly, have fallen into heresy, the scourge of our age). If people knew anything about the Old Jesuits, they would shut their mouths, because the Old Jesuits were men of unspeakable holiness, intelligence, and BRAVERY. Let us pray that Pope Francis follows the lead of the Old Jesuits: Jogues, Bressani, Campion, Southwell, Brébeuf, Le Moyne, Lalemant, Lalande, and a million other examples. Many of the comments I hear about Jesuits are just plain ignorant: especially when one considers the amount of harm non-Jesuit priests have done to the Catholic Church. This canard needs to die. In summation, I feel that God has blessed us. Pope Francis will be a wonderful Pope. However, he will not be as great a Pope as Benedict XVI, because we will not see a man of that character, intelligence, and holiness for many, many years in my humble opinion. * A friend E-mailed me and let me know the Jesuits are reforming, and their new priests are young and orthodox — Deo gratias!